A few weeks ago, the inestimable Julie of Lone Prairie Blog posted this poem in one of her “Google Gadgets.” I commented that I loved the poem, and I believe Julie said that it was the word “glazed” that got to her every time she read the poem. To me this is one of a few quintessential poems. While some poems use ornate and beautiful language, and while some can go one for pages in their descriptions and thoughts, The Red Wheelbarrow is what I would call a picture poem. It gives us a simple image in three layers – a barrow, water, and chickens. In my mind I can see each part of this picture as Williams introduces it. Of course, he comes to each part of the picture by first using language that will modify the items that follow, which helps build up some linguistic tension in this short work. It is only after you see the whole picture in your mind that you are taken back to the beginning of the poem and its curious introduction: “so much depends upon.” This short phrase is what makes this poem a classic in the English language as far as I am concerned, for we are left to ponder what it is that Williams means by introducing the poem in this way. The opening lines set the tone for the rest of the poem. Since the poem is composed of one sentence broken up at various intervals, it is truthful to say that “so much depends upon” each line of the poem. This is so because the form of the poem is also its meaning. This may seem confusing, but by the end of the poem the image of the wheelbarrow is seen as the actual poem, as in a painting when one sees an image of an apple, the apple represents an actual object in reality, but since it is part of a painting the apple also becomes the actual piece of art. . . .
. . . Notice how the monosyllabic words in line 3 elongate the line, putting an unusual pause between the word “wheel” and “barrow.” This has the effect of breaking the image down to its most basic parts. The reader feels as though he or she were scrutinizing each part of the scene. Using the sentence as a painter uses line and color, Williams breaks up the words in order to see the object more closely.
. . . The word “glazed” evokes another painterly image. Just as the reader is beginning to notice the wheelbarrow through a closer perspective, the rain transforms it as well, giving it a newer, fresher look. This new vision of the image is what Williams is aiming for. The last lines offer up the final brushstroke to this “still life” poem. Another color, “white” is used to contrast the earlier “red,” and the unusual view of the ordinary wheelbarrow is complete. Williams, in dissecting the image of the wheelbarrow, has also transformed the common definition of a poem. With careful word choice, attention to language, and unusual stanza breaks Williams has turned an ordinary sentence into poetry. Ken Stephens: It’s stupid. Nothing only depends on a wet, red wheel barrow sitting beside white chickens. Olivia Williams: I read your review on that poem “The red Wheelbarrow.” i thought i would ask you why you liked it. Personally, i didn’t like it at all. I thought it was strangely…stupid. My six year old sister could write the same thing. Thanks for your time. Templin2005: Reading the Red Wheelbarrow is about as life changing as watching grass grow. It would be better for you to smack yourself with a brick and run into oncoming traffic than to waste your time reading this meaningless and pointless poem about wheelbarrows and chickens. Robert Gambrel: I think that the wheelbarrow should be yellow. Justin Carey: I think that is a very goo[d] poem because it is short. cccustard: This works for me on two levels. First there is the red wheelbarrow, and then there are the white chickens. And holding the two together is the glassy rain. I like to think of the wheelbarrow as say the fourth or fifth floor, and the chicken as the ninth floor, and the rain as the emergency fire stairs. They are all dependant upon each other and yet upon nothing. It wouldn’t be the same if it was sleet or even a heavy mist. No way. One blogger has this to say: William Carlos Williams once wrote that “so much depends upon a red wheelbarrow, glazed with rainwater, beside the white chickens.” And he was an idiot. William Carlos Williams‘ 1923 poem The Red Wheelbarrow exemplifies the Imagist-influenced philosophy of “no ideas but in things”. The poem, written in two minutes or so, portrays the scene outside the window of one of Dr. Williams’ patients, a very sick child he was attending. This provides another layer of meaning beneath the surface reading. The poem is intentionally plain and lucid. Williams was trying to veer away from what he saw as the “European” verbosity of his peers (T. S. Eliot, for example), to create a typical “American” image with his poem. The subject matter of The Red Wheelbarrow is what makes it most unique and important. He lifts an ordinary scene to an artistic level, exemplifying the importance of the ordinary; as he says, a poem “must be real, not ‘realism‘, but reality itself.” In this way, it holds more in common with the haiku of Bashō than with the verse of T. S. Eliot. Bashō, a master of Japanese haiku, wrote poems that are somewhat similar to The Red Wheelbarrow (e.g., “Moonlight slants through/The vast bamboo grove:/A cuckoo cries”). “This stark, elegant piece always reminds me of the versatility of poetry and the agility of precision-crafted writing. The poem’s opening couplet (“so much depends upon”) starts the reader on a traditional poetic journey into desires or physical imperatives which must be satisfied. This is what poetry is good at: finding emotional fault lines, tracing needs and wants, describing action or setting in a way intended to convey something conceptually more complex – more meaningful. Or I should say, this is what we do easily with poetry. But somewhere between the second and third couplets, the poem makes a shift. (Actually, this is when the reader makes the shift. The poem itself transforms with the phrase a wheelbarrow, rather than calling out the wheelbarrow.) The language is not a high-flying metaphor or parable for anything. It does not teach, complain, exalt, condemn – or do any of those other didactic things poems usually do. Instead, the poem settles in to an intensely visual sensibility; and though the descriptive elements are really quite scant – a red wheelbarrow, wetness, white chickens – the resulting still-life has a rich, painterly quality. Williams does not so much describe an image as create one. Still, the powerful opening couplet refuses to let the reader simply take in the scene, as if it were depicted on a canvass. There is a temporal, narrative element – and an urgency – quite apart from the visual snapshot. The mundane object and unremarkable birds are presented without the hint of action or any trace of expressive quality; and yet, we ache to know: who or what depends on a wheelbarrow, and why? The beauty of this tension, and of the interplay of discursive strategies within the fourteen spare words of the poem, has kept me returning to this poem for years. So much depends too Upon the cold mail handler Crazed with Frost blister Dumping out the Drab mail sack. William Carlos Williams told his wife that it was the greatest moment of his career, the single greatest compliment that he could have received. I wish I could remember the exact language in the Doubletake description of the event the above poetry text I found online in an interesting essay on rural mail handlers. Simplicity is the hallmark of William Carlos Williams’s most original work, which never loses its mysterious freshness. Like Wordsworth, Williams sought a common language to close the gap between poetry and everyday experience. “The Red Wheel Barrow” invites us to cast off habit and look at life again with childlike wonder. The poem is an example of Imagism, a modernist Anglo-American movement influenced by unrhymed Asian poetry (such as haiku and tanka) that strictly limits the number of lines and syllables. In Imagist poetry, sharp physical details are presented but not explained: the images must speak for themselves. Anij: Have you ever experienced, a perfect moment in time? 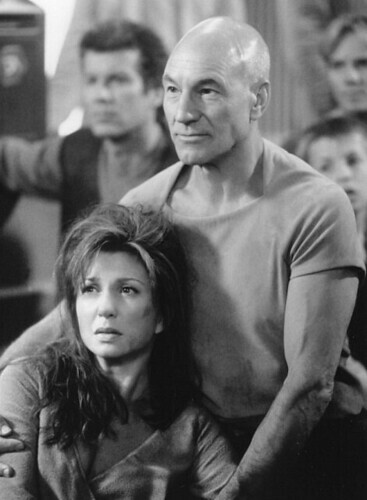 Captain Picard: A perfect moment? Anij: When time seemed to stop, and you could almost live, in that moment. [SPOILER ALERT] Later in the film, Anij is in danger of dying, and Picard must try to save her carrying out a similar feat all on his own, since she doesn’t have the strength to do this herself or even aid him in the attempt. As time slows down to almost a stand still, we see the beauty of the moment in Picard’s and Anij’s faces and even in the elements we see in the cave in which they find themselves. For me, this scene is one of the greatest pieces of film-making in the entire Star Trek franchise. Ricky Fitts: Because it’s beautiful. What do these films and quotes have to do with The Red Wheel Barrow? For me they and the poem are all about being awake and aware of where and when we are. It is about being in the moment and trying to live there as well. Many of us often try to either live in past or in future. Sometimes we retreat into the nostalgia of our rose-colored memories when the present becomes too difficult to accept. And at other times, when we are going through what seems to be hell itself, we hope for the future to come and save us from our current problems. But when we engage in either practice, we fail to live as fully as we might in the present time. One of my stock answers when people ask me how I am is, “I’m awake.” I say this for at least two reasons. One, I am joking about the fact that I often get too little sleep, and therefore I am lucky that my eyes are open and I am not openly snoring in their presence. Two, I use to term in the Buddhist sense: I am aware (or at least I am trying to be aware) of what is happening right now. Part of this is simple wishful thinking, of course. I want to live in the present. I want to recognize what is happening around me. I want to see the beauty of this world and my life, even if it is at times a “terrible beauty.” If it is true that Williams wrote this poem after the death of a young child in his care, and after he had looked up to see the image he describes in his poem outside a window in the child’s home, then this indicates to me that perhaps he was thinking along the same lines. And even if this story is not true in a literal or historical sense, it seems to me that it is still truth in a metaphorical sense. Below you will find a video from YouTube that is also a metaphorical interpretation of Williams poem. Posted on May 20, 2007 December 13, 2014 by WPosted in poetry, William Carlos WilliamsTagged American Beauty, awake, beauty, Star Trek: Insurrection, The Red Wheel Barrow, William Carlos Williams. Thanks for the kind comment on my notes about this poem, as they appeared on the blog po-i-tre. So many of the commentators fixate on the “imagist” aspect of the poem, without unlocking the magic created by the tension between the opening line and the rest of the poem. For me, The Red Wheelbarrow has always been as much a meta-poem (a work about the dynamics of poetic application of language) as a poem itself.